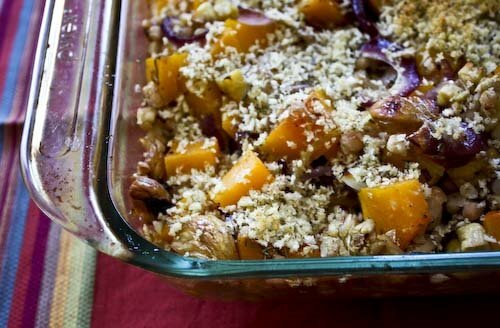 I've had my eye on this recipe ever since I made the Quinoa Stuffed Squash, when I was searching for butternut squash recipes. So when I ran across some fresh chestnuts, I scooped them up immediately. The recipe comes from Veganomicon, by Isa Chandra Moskowitz and Terry Hope Romero. If you're a vegetarian or vegan, you probably know them from the Post Punk Kitchen, their public access and podcast vegan cooking show, which you can find on-line. If you're not a vegan, you should know that it just doesn't matter when it comes to this cookbook. Although this is somewhat of a sacrilege, I often make their recipes either with the vegan ingredients (like vegan margarine or alternative milks) or without simply by reverting to the classic ingredients of butter and cow's milk. 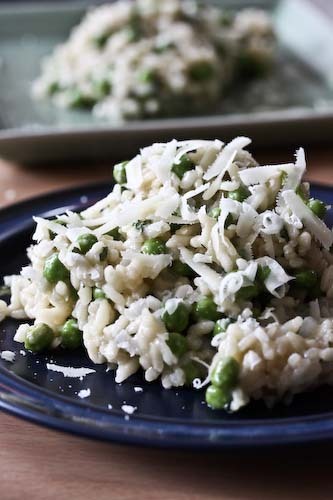 That aside, the point is that if you're trying to limit the meat in your diet or just need a few amazingly delicious ways to add more grains and greens, this book fits that bill. You could think of Veganomicon as the vegan Joy of Cooking in that it encompasses all meals and most occasions. But the recipes are so much more creative and even my staunchly meat-eating fiance has never been disappointed. So that's my plug. I love this cookbook, the recipes always work and they're always great. Case in point, this Carmelized Onion and Butternut Squash Roast with Chestnuts combines some of the very best of what the season has to offer. Although you may use canned chestnuts, if you're thinking of giving this recipe a go now, try to get your hands on some fresh ones, which are in prime season from October to January. I'd never really used fresh chestnuts before, but they're worth it! Preheat the oven to 425. Slit each chestnut a bit so they don't explode while roasting, and lay them on a pan. Roast for 25 minutes. Remove from oven and let cool a bit, then peel. The easiest way to do this is to crush them together a bit to loosen the shells from the nut by laying them in a paper towel, bunching it up, and rubbing them together. Chop the nuts coarsely. Place the onions in a 9x13 inch baking dish and toss to coat with the olive oil. Bake for about 30 minutes, stirring occasionally. Remove from oven and set aside. Add the rest of the ingredients for the roast and stir so that everything is well coated. Cover tightly with foil and bake for 35-45 minutes until the squash and nuts are tender. Toss all of the ingredients together. Remove the foil from the pan and spread the crumbs evenly on top. Bake for an additional 15 minutes, until the topping is lightly browned. Dig in! I'm submitting this lovely autumn dish for Cook Sister's edition of Waiter, There's Something in My...Gourd! So be sure to check out the round-up when it's posted in early November! I'm not a vegan eater either, but every recipe I have ever made from Post Punk Kitchen has been a hit. Those kids really know what they're doing! Glad you featured this here! I'm not a vegan either and have been on teh verge of buying this book for a while. I might just have to. This recipe looks so so fantastic! I love when the chestnuts start to fall from the trees like rain around here. maybe I'll go scavenging soon. Micha, I totally agree, those girls are good at what they do! We've never been disappointed by them! Jesse and Jen, take the plunge, seriously, this book is so good! And Jen, if you have chestnuts actually falling from trees, you're a lucky girl. That was the most expensive part of this recipe for me! Dana, I think I may have been a veg in a former life. I'd say I eat meat maybe 2-3 times a month, tops. I just tend to be more inspired by plant food than animal. Andrea, thanks for your suggestion of the Neue Gallery cafe for lunch in NYC - that room is gorgeous - we enjoyed it! I've got a LOT of squash in my kitchen at the moment, this looks like a great way to use it! Been hearing a lot of good things about that book myself. I'll definitely check it out even if I'm not vegan. Denver Native, no problem! The Neue is one of my favorite places in NYC! Esi and Jude, I love this book, even if I'm not vegan. It provides lots of tasty ways to use veggies! Sam, lucky you! I wish I had a LOT of squash! 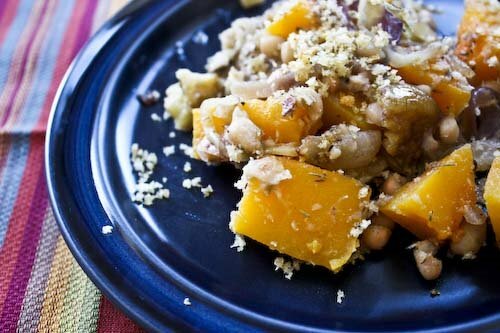 Caramelized onions and roasted squash is a really nice combo! wow, I'm not a great fan of gourd, and yet this looks really pretty! 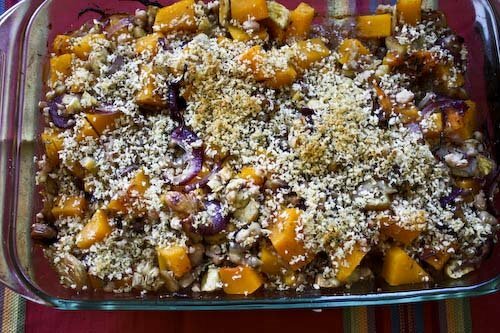 it'd be great if you could send it to my Vegetarian Thanksgiving reccipe event!